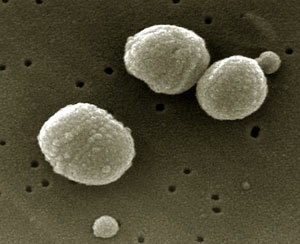 The type Streptococcus pneumoniae (pneumococcus) is a gram-positive, round-oval to lanceolate cocci with a size of 0.5 to 1.25 mm, which as the previous name "Diplococcus pneumoniae" expresses, are usually mounted in pairs. 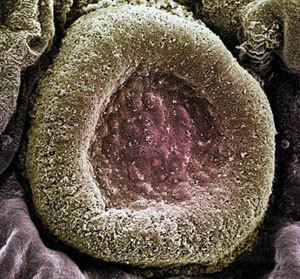 The adjacent cells are surrounded by a polysaccharide capsule. Because of its chemical structure, the capsular polysaccharides in serological types (serovars) are distinguished. Pneumococcal require a complex medium for propagation. The medium of choice is blood agar plates. To develop these in an aerobic atmosphere slimy colonies appear light reflection caused by the bright shiny. Often forms around the colonies, a viridans yard (a-hemolysis). The addition of CO2 to the atmosphere favors the cultivation of most strains. The crucial role for the pathogenicity has the polysaccharide capsule. The capsular polysaccharides are released during the propagation in the environment, thereby neutralizing antibodies and omitted the required opsonization for phagocytosis of pathogens. However, there are great differences in the virulence of individual capsule types. Unbekapselte strains are avirulent. Possible additional virulence factors are pneumolysin, an oxygen-labile enzyme Hemolyzing, and an IgA1 protease. Antibodies to the capsular polysaccharides give a high degree of type-specific immunity. According to the Danish nomenclature currently 90 different serotypes can be distinguished. Of these, 10-20 are responsible for the overwhelming proportion of human infections. Some pneumococcal disease (eg sepsis and meningitis) occur most frequently in certain serotypes. Likewise, differences in the Serotypenverteilung between children and adults. In addition, geographical differences are observed, which can change the serotype distribution over time. Pneumococci colonize the mucous membranes of the upper respiratory tract. The carrier rate in healthy adults varies between 40% and 70%. The infections usually occur endogenously. The most important pneumococcal disease is pneumonia, while the lobar pneumonia is no longer as prevalent as before. 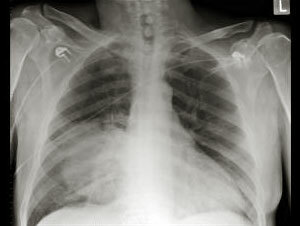 The lobar pneumonia usually occurs in patients with local or general weakness on defense (eg influenza). Risk factors for pneumococcal infections are advanced age, cardiopulmonary disorders and alcohol base. For strongly infection-prone patients (eg, granulocytopenia Scheme, patients with Milzexstirpation), pneumococcal pneumonia has a particularly poor prognosis. Serious pneumococcal infections are usually bacteremic and often lead to further complications (meningitis, peritonitis). Lobar pneumonia is now more frequently than the bronchopneumonia. Other diseases that are often caused by pneumococci, are the acute exacerbation of chronic obstructive bronchitis, sinusitis, otitis media and meningitis. The microbiological diagnosis made microscopically and culturally. Pneumococci can be well on blood agar plates or in liquid culture media containing blood cultured. However, the period between sample collection and processing be as short as possible, because the cause of the pneumococcal autolytic enzyme system for the rapid death of the pathogen can. In determining the antibiotic sensitivity of detection of pneumococci with reduced penicillin susceptibility (MIC 0.1 mg/l) is important. The decreased penicillin sensitivity is achieved through changes in the penicillin-binding proteins (PBPs). Simultaneously, the affinity of cephalosporins and carbapenems to PBPs is reduced. The resistance is caused by mutation and chromosomal conditions. The resistance genes can be transferred both from tribe to tribe and of streptococci of the viridans group of Streptococcus pneumoniae. The proportion of strains with low-grade resistance to penicillin (MIC = 0.1-1 mg / l) in Germany is 50-10%. Highly penicillin-resistant strains (MIC = 2 mg / l) in this country are still very rare (<1%). In contrast, took as specified by the National Reference Center for Streptococci, the prevalence of macrolide resistance in invasive pneumococcal disease in the period from 1992 to 2000 from 3.0% to 15.3%. Among the isolates from pediatric patients were on average almost 30% of resistant strains. For the majority of macrolide-resistant strains are found cross-resistance with clindamycin (Sobelin etc.) and also a resistance to chloramphenicol (Paraxine etc. ), cotrimoxazole (EUSAPRIM etc. ), and tetracycline. Antibiotic of first choice for pneumococcal infections is still penicillin (various trade names). With adequate dosage can also infections by strains with low-grade resistance to penicillin can be treated successfully with penicillin. In pneumococcal meningitis, but also the low-grade penicillin resistance leads to treatment failure, because the killing of pneumococci required for drug concentrations in CSF are not achieved. A subset of patients with meningitis by penicillin-resistant pneumococci are also highly cefotaxime (Claforan, etc.) and ceftriaxone (Rocephin etc.) is ineffective. See www.ndrugs.com for medications. Penicillin-resistant strains are always sensitive to rifampicin (RIFA, etc.) and vancomycin (VANCOMYCIN CP and others). Imipenem (ZIENAM) and meropenem (Meron) are also still effective in vitro. The spectrum of activity of telithromycin (Ketek) also recorded macrolide-resistant pneumococci. Telithromycin is the first of the ketolides, which are chemically derived from the macrolides. The older fluoroquinolones ciprofloxacin (Cipro, etc.) and ofloxacin (Tarivid others) are no effective agents for the treatment of pneumococcus infections. In comparison, the newer fluoroquinolones levofloxacin (Tavanic etc.) and moxifloxacin (Avelox, etc.) also received approval for treatment of pneumococcal pneumonia. Resistance to newer fluoroquinolones in Germany so far has been detected only in individual cases. According to the World Health Organisation, die each year about two million people have lung inflammation. 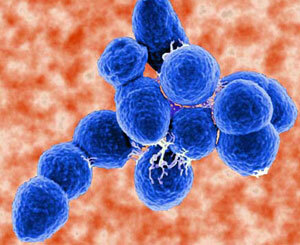 One of the most common pathogen is Streptococcus pneumoniae. In addition to elderly and chronically ill people, it mainly affects children under five. Since 1941, doctors have known tribes, not against penicillin works. Again and again on streptococci, which are resistant to a number of antibiotics. Is there a vaccine can protect the baby from the second month of life. Since then, according to physicians decreases the number of serious illnesses by S. pneumoniae.